Four people were killed and dozens more were injured when a Grand Central-bound Metro-North train derailed in the Bronx early Sunday, turning cars on their sides and throwing passengers into the air on one of the busiest travel days of the year as people head home from Thanksgiving gatherings. Metro-North said four cars on the seven-car 5:54 a.m. train from Poughkeepsie derailed at about 7:20 a.m., just feet from the Harlem River as the train was rounding a curve about 100 yards north of the Spuyten Duyvil station. It was due at Grand Central at 7:43 a.m.
Three of the four people who were killed were ejected from the train and more than 60 people were injured, including 11 critically, authorities said. The MTA had identified the four people who died by early Sunday evening: Jim Lovell, 58, of Cold Spring, N.Y.; James Ferrari, 59, of Montrose, N.Y.; Donna Smith, 54, of Newburgh, N.Y., and Ahn Kisook, 35, of Queens, N.Y. The train's engineer, who was running the train, was also among those hurt, but is conscious and talking, Police Commissioner Ray Kelly said. When first questioned by emergency workers, the engineer claimed he tried to apply the brakes to slow the train before the curve, but the brakes failed, several senior officials told NBC 4 New York. Still, it could be weeks before investigators officially determine the cause of the derailment. The black box aboard the train had been recovered by Sunday evening, sources said, and it will be analyzed for data that may point to the cause of the derailment. 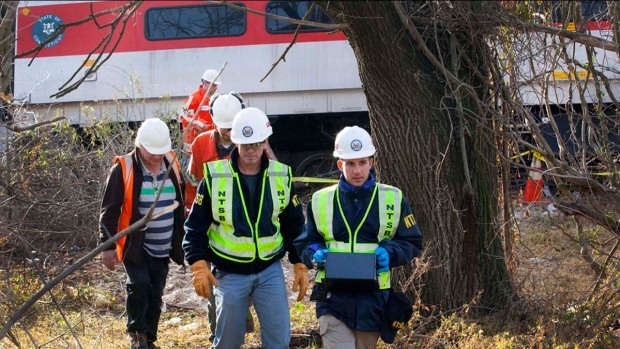 NTSB investigators are combing over Metro-North derailment evidence as survivors and witnesses talk about the moments during and after the crash. Michael Gargiulo reports. Initial reports that cars were in the water turned out to be untrue; police divers searched the water for victims as first responders combed through the wreckage. No one was found in the water, and Gov. Cuomo said at the site that everyone had been accounted for. Passenger Dennis O'Neil said he believed the train was going too fast before it crashed, throwing him against the window. "It was coming towards Spuyten Duyvil and you could feel it starting to lean and it was like 'hey what's going on,' and then it hit the curb real hard and flopped over and slid down the hill," said O'Neil. "A couple people were hurt very badly right in front of me." Joel Zaritsky, a passenger on the train, told The Associated Press he was on his way to Manhattan for a dental convention. The MTA has had a rough year that has included several derailments in just the last six months. Andrew Siff reports on some of the recent incidents leading up to Sunday’s derailment. MTA spokeswoman Marjorie Anders said the big curve where the train derailed is in a slow-speed area. The speed limit on the curve is 30 mph, compared with 70 mph in the area before the curve, Anders said. The black box should be able to tell how fast the train was traveling, she said. 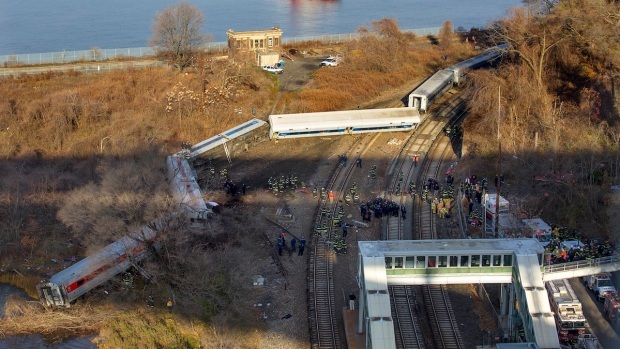 Cuomo said the curve alone did not explain the derailment. "The curve has been here many many years, and the trains take the curve here 365 days a year," he said. "So there has to be another factor." MTA Chairman Thomas F. Prendergast was asked at the news conference if speed was something authorities planned to investigate. "That'd be one of the factors,'' he said, adding that the focus now was on the passengers who were injured. Law enforcement officials say there is no suspicion of any criminality. A spokesman from the National Transportation Safety Board told reporters that NTSB investigators were expected to be on the scene for the next week to 10 days. All Metro-North trains between Tarrytown and Grand Central were suspended Sunday after a deadly derailment in the Bronx, and Monday's commute will be affected as well. Brynn Gingras reports. The tracks will be turned over to the MTA for repair after the NTSB finishes its investigation. Earl Weener, an NTSB board member, said investigators had yet to interview the train crew. "We haven't spoken to the conductor," he said. "We expect to be interviewing the train crew within the next couple days." Sunday's Metro-North Derailment happened not far from the site where a freight train derailed back in July. Pei-Sze Cheng has more on the role train speed and a curve near Spuyten Duyvil may have played. One of the passengers on board said he didn't notice anything out of the ordinary before the derailment. "There was absolutely nothing suspicious happening on the train," said Steven Ciccone, who was traveling from a Thanksgiving celebration. "All of a sudden it started to shudder, and then it started to slip." Service on the Hudson line is suspended indefinitely. Metro-North said it was providing shuttle bus service between the Tarrytown Station and White Plains station until 2 a.m. Monday. Beginning at 5 a.m. Monday, the MTA will provide a bus shuttle between the Yonkers station and 242nd Street, where there is a 1 train stop. terminus of the Broadway #1 local subway, until further notice. Amtrak service between New York City and Albany has been restored, but will be running at slower speeds. In July, a CSX freight train hauling trash derailed in the same area, near the Spuyten Duyvil station, due to a track issue. Nobody was injured in that derailment, and officials said Sunday that they do not believe this latest crash was related to the July derailment. This is second passenger train derailment on Metro-North in six months.